Bogie? As a Mexican Bandito? What the heck was Warner Bros. thinking? It's interesting that a 24-movie boxed set devoted to Humphrey Bogart showcases various films in which Bogie is overlooked or misused. Case in point, Virginia City (1940) a Michael Curtiz movie that would have been another Errolivia (Errol Flynn & Olivia de Havilland) vehicle were it not for de Havilland being fed up with Errolivia pictures altogether. Curtiz wasn't an actor's kind of director. He didn't care for them and they didn't care for him. And Jack Warner, one of the heads of Warner Bros. studio, wasn't an actor's kind of guy either. Jack Warner was particularly notorious for making actor's lives miserable by "guiding" their careers with a heavy hand. Olivia de Havilland had quite a difficult time with him and she had to fight tooth and nail to be lent out to play Melanie in Gone with the Wind (1939). And Bette Davis's career was put on hold when she went into an all out battle against Warner Bros. and what she deemed were the pathetic roles they were giving her (I actually prefer the blonde and spunky Bette Davis to the older more cynical brunette Bette). 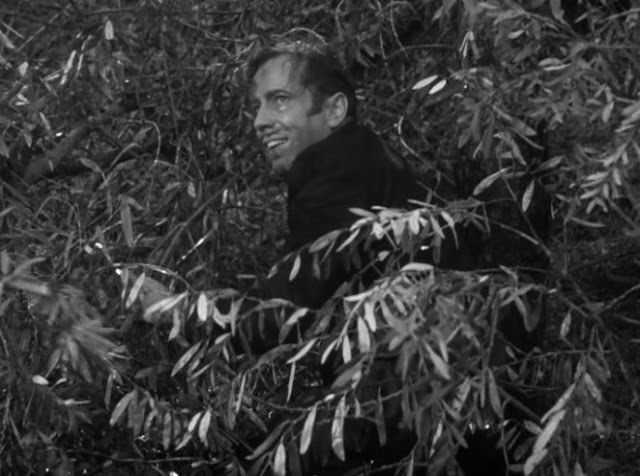 Humphrey Bogart didn't have the greatest time with Warner Bros. either. They didn't know what to do with him and tossed him around from picture to picture giving him a variety of small roles. Eventually the movie-going public caught on to the wonder that is Bogie and his fame exploded. But before then, he was stuck in roles like Mexican bandito John Murrell in Virginia City (1940). Paul, over at Art, Movies, Wood and Whatnot... loves this movie and recommended it to me after I watched Dodge City (1939). Dodge City is a Curtiz-Errolivia picture which in my opinion is better than Virginia City. Both films are very similar and seeing as they are 1 year apart, I felt like Virginia City was a follow up to Dodge City. Each film is named after a city although Dodge City spends more time in the actual city whereas Virginia City has more wanderlust. Both films feature the save-the-day hero Errol Flynn who has an appropriate (if not fiesty) love interest. Both also feature a young boy being hurt (the death of innocence out in the West?) and a bandit or troublemaker who takes the law into his own hands. But it's only in Virginia City in which you will see see Bogie, with a Spanish-style mustache trying to talk in a Mexican accent but failing miserable as his iconic New York accent breaks through. Not only is Bogart miscast in this one, but so is Miriam Hopkins, probably Flynn's worst leading lady. Not only does she look uncomfortable in her scenes with Flynn, but her song renditions are pretty bad too. I love Hopkins in many of her roles, but not here. Been enjoying these Bogart reviews. its been a number of years since i've watched Virginia City but i can still hear Bogie saying "Si Senior" in that inimitiable oh so NOT mexican voice of his, lol! that's very interesting you prefer the early Bette to the later more well-known Bette. i like them both for diff reasons, but just for how she looks, the earlier short bob blonde Bette with those enormous blue eyes is a unique and striking vision! Dear me, how I hated this film! I felt embarrassed for Bogie. Even Errol couldn't redeem how terrible the entire movie was. 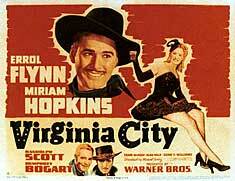 I found it interesting that at the end of Dodge City, Errol and Olivia are about to move to Virginia City. So strange. Kevin - oh don't get me started with Miriam Hopkins. Groan. Seriously not a good fit for this movie. Great actress, just not the role for her. I don't think Olivia de Havilland would have been that great either. Perhaps Ann Sheridan? Paul - you have a point there. Warner Bros. really did take a gamble with Errol Flynn and Olivia de Havilland. From the doc I saw, the studio seemed to make several possible financially disastrous decisions that came out glorious. Thank goodness for some risk-taking. Seems like studios today want a sure thing and then we are overloaded with crappy remakes and sequels galore. Emm - Wow you really don't like it. It would be cool if you and Elgart had a back-and-forth convo about it. I totally forgot about that part in Dodge City! Weirdness. Thanks for stopping by. you nailed it Quelle, Ann was the one that shoulda been in Virginia city instead of Miriam Hopkins and it shoulda been in color too. Virginia City is pretty bad. The thing is I had just watched the terrific Dodge City about a week before I saw Virginia City and I was thinking this is going to be very good. How wrong was I. The movie just never clicked for me. Miriam Hopkins, who I love, was totally wrong in this role as was Bogie. As good as Dodge City was, Virginia is the complete opposite.